What Is a Sterilizing Solution? The first time a friend of mine admitted she never used public restrooms and seldom used bathrooms in other people's homes, I was taken aback. She wasn't phobic, she simply didn't trust how germ-free toilets and sinks were if she hadn't cleaned them herself. Limiting? Certainly. Was her distrust based on fact? Quite possibly. The truth is, germs do thrive in moist spaces, and vulnerable people can get sick from germs in a bathroom. But we would be kidding ourselves if we thought the germs stayed there. Believe me, they travel! So the healthier your immune system is, the better you will fend off germy invaders in any room of the house. However, given the moist environs in a bathroom, nearly every surface is a breeding ground for bacteria to flourish--even the air we breathe. Right now, though, let's focus on where they are in the bathroom and what we can do about it, so that a trip to the toilet is as good as a trip to the spa and not the barn. Toothbrushes often share spaces such as a cup or holder. Residual particles of food and blood can remain in the bristles of a toothbrush, and under the right conditions can become harmful. Saliva can contain the rhinovirus (the cause of the common cold) which can survive up to three hours outside the human body. Candida is another common germ found on toothbrushes, as well as streptococci mutans and lactobacilli bacterium from dental plaque A nontoxic and effective solution to killing bacteria on toothbrushes (and cups) is to apply a drop of an antimicrobial essential oil such as clove or peppermint after each use. Not only does this create a unfavorable environment for bacteria to grow, it will improve the health of your gums and give your toothpaste a real kick of flavor. Or, if you'd rather, switch to disposable wooden tooth picks. 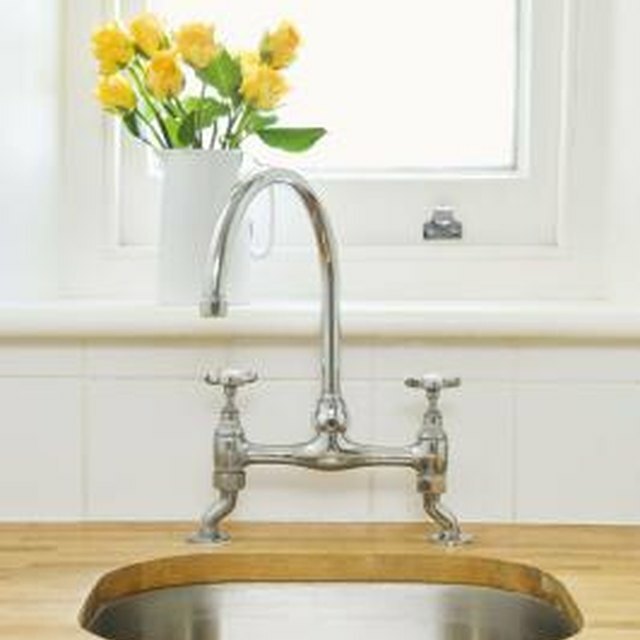 Flat bathroom surfaces such as counters, floors, shelves and cabinet drawers attract airborne debris, such as microscopic particles of dead skin that fall from our bodies and clothing, germs carried airborne by the flush of the toilet and germs spread by touch or by setting an object or towel upon a surface. In public restrooms, faucets have higher concentrations of germs, simply because their surfaces are seldom dry, and people handle them frequently with bare hands. [Shower curtains](https://society6com/shower-curtains?utm_source=SFGHG&utm_medium=referral&utm_campaign=8610) show the growth of fungi and bacteria most visibly, as they are most often just left to dry and never wiped down as a sink counter top might be every day or week. The inner walls of a tub are prime real estate for growing bacteria from dead skin cells also. It's impossible to clean all surfaces after every use, so keeping a bathroom well-ventilated and dry will go a long way toward keeping the growth of bacteria to a minimum. Spraying surfaces once a day with a nontoxic antimicrobial or disinfectant such as aromatic vinegar water is better than nothing. Or, invest in an oil diffuser, and diffuse a purifying antimicrobial essential oil such as thyme or lemon while you shower. Hospitals in Europe diffuse oils regularly to combat the spread of airborne germs, as do selected medical facilities in the United States. Sponges and loofahs harbor bacteria in their porous crevices, spreading germs when reused. More than one esthetician has cautioned me to never use a face cloth twice, but to always use a fresh one. Dead skin cells, bodily oils, nasal secretions and even yeast remain on these cleansing "tools" for bacteria to feast and multiply on, so common sense tells us to throw them in the laundry when done. The hotel industry may desire to save energy by having us reuse towels, but any material that we wash our bodies with should be cleansed properly after each use. The toilet is a great invention, except for those of us who have to clean it. Pathogens originating from the toilet bowl are a cause for concern, and if some are catapulted into the air when flushed, then it behooves us to clean surfaces and disinfect toothbrushes. Excretions do contain natural flora that are useful in the environment, but unless you have a good plan for removing and treating it, your toilet bowl will be a contributor to the concentration of bacteria in the bathroom. Urine is a sterile fluid, and we shouldn't worry when we come into contact with it. But if you have read the hype on respiratory pathogens and travel with a face mask, a better piece of advice would be to keep a bottle of peppermint essential oil to inhale instead, chew on Vitamin C and trust your immune system to protect you. For odor control try white vinegar in the toilet. It eats uric acid, and 1/2 cup in the bowl will help keep odors neutral while saving flushes. Also, keep the toilet brush in a solution of purified water, clear dish soap and antimicrobial essential oil of tea tree or peppermint. The whole point of keeping a bathroom, and yourself, clean is to prevent the spread of disease and illness. Health is priceless, to be sure, but understand that the germiest of bathrooms can be survived if your immune system is strong. We can go the extra mile to keep germs at a minimum in the bathroom, but at the end of the day, germs are everywhere. So keep a bottle of chewable vitamin C in the medicine cabinet and teach others some of your healthy habits while you are at it. Denise Graziano has been a professional writer and editor since 2003. Her work appears in "Horticulture Magazine" and for a variety of private, corporate publications. She holds a Master of Business Administration and a Bachelor of Science in speech. What Scents Do Roaches Not Like?